Your Brain On Twitter: No Hands Necessary Adam Wilson, a biomedical engineering graduate student at the University of Wisconsin-Madison, has figured out how to "tweet" using the power of his brain. 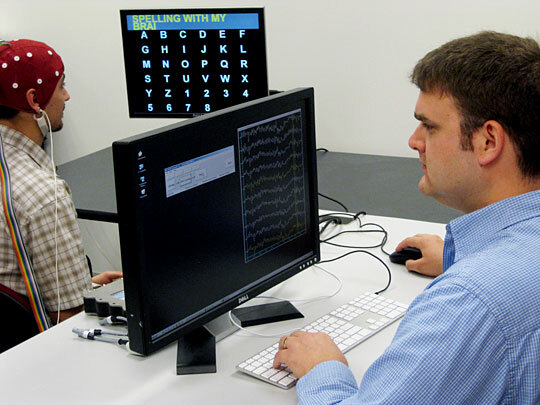 A cap with electrodes scans the brain, while a person concentrates on one letter at a time to create a message on a computer. Adam Wilson (right) and Leo Walton practice the technology at the University of Wisconsin-Madison. For millions of people, the social media site Twitter has become a way to let the world know what they're thinking in 140 characters or fewer. But forget fingers flying over keyboards. Adam Wilson, a biomedical engineering graduate student at the University of Wisconsin-Madison, has figured out how to "tweet" using just the power of his brain. His method uses brain-computer interface, or BCI, software. Wilson tells NPR's Michele Norris he got the idea from Roger Ebert's blog in March. "He was talking about twittering in this article and at one point he said, 'In the near future, people will just be using their brain activity to update their Twitter accounts,'" Wilson says. "I thought, 'I could probably have something like this working tonight.'" Wilson said he "hacked" the brain-computer interface software and did a test message that night. The next morning, he says, he sent the first message with his brain activity. "It was a pretty neat experience — just to have that kind of a quick turnaround on a new idea like this," Wilson says. "I ripped off the cap and was running down the halls telling the other members of the lab what I had just done." That "cap" is a swimming cap that has a series of electrodes that look for the part of the brain related to attention, Wilson says. As letters and numbers flash on the computer screen randomly, the person pays attention to a specific letter. "Every time their letter flashes, the brain goes, 'Oh wow, the thing I'm waiting for just happened,'" Wilson says. "If we do this enough times, we can go back and see which letter their brain is responding to." But the letter-by-letter exercise takes a lot of concentration. "If I space out for five or 10 seconds, it doesn't really work as well," Wilson says. The target audience is people who have amyotrophic lateral sclerosis (ALS), also known as Lou Gehrig's disease, or a brain-stem stroke. "On a practical scale, addressing the wants and needs of people who are in this condition, just the ability to kind of keep their family up to date — 'I'm feeling good today, or I'm not feeling so good today, can you come visit?' — I think would be very welcome by the type of people we're aiming this toward.'"